Discussion in 'iPhone Jailbreaking' started by aox4121, Dec 21, 2016. 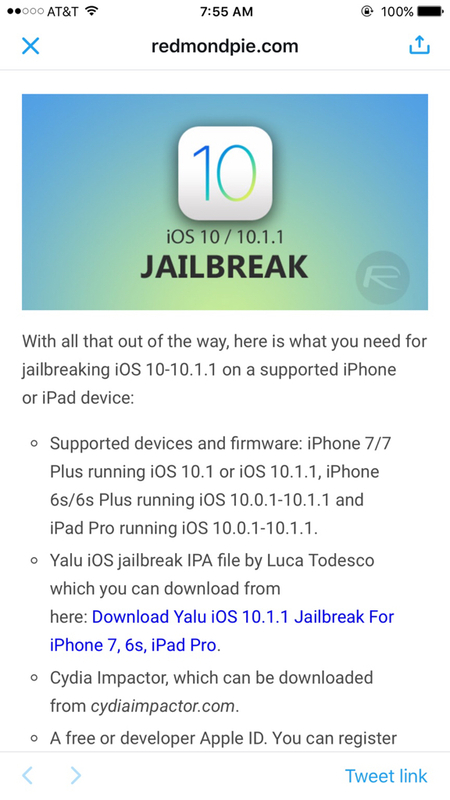 Veteran jailbreaker, Luca Todesco (@qwertyoruiop) has released his much awaited first public jailbreak for iOS10.0-10.1.1. As usual, in the early days, it's very unstable right now. Cydia Substrate still doesn't work. Give it time, gang. Don't risk your 10.1.1 firmware quite yet. But light at the end of the tunnel now! The only problem is that Apple stopped signing all iOS 10 versions older than 10.2 yesterday. Yes. Most people following all the jailbreak Twitter sites , Redmond Pie and Reddit knew to get to 10.1.1 before yesterday. No way to have missed it. But i0nic is also talking about the 10.2 JB ready by 12/28. But i0nic has misled us before. So we'll see. This jailbreak is for iPhone 6s, iPhone 7 and iPad Pro only. And the plus versions of 6S and 7. Verified. Luca himself has recommended that no one try this jailbreak unless they are an experienced developer as it is currently too glitchy and unstable for general use. He was referring to his pre-public launch yesterday early. The one last night he removed that warning from. Many users are quite stable now from the Twitter-sphere and Reddit. No Cydia Substrate yet - but those who like MovieBox are reporting no issues. But I agree.. proceed with caution in the early days of a new JB. No real way to enter safe mode from a reboot with these semi-tethered jailbreaks. Just hard reboot into nonJB mode (home button and power button together until you see reboot logo). Or power button and Volume Down button if on iPhone 7/7Plus. After your phone reboots - you're no longer jailbroken. Use the MachPortal tool to get jailbroken. But do NOT use Substrate Fix yet!! Then simply go into Cydia and remove the offending tweak. THEN use Substrate Fix to reenable your tweaks. The problems should be gone if you removed the offending tweak. There are some apps that are designed by their developers to not work on a jailbroken device. Some of your crashing apps could be these. I'm afraid you don't have a choice. You'll have to connect to iTunes and restore your iphone. If you have a backup made before the problem, you can set up your iPhone from that backup.